Genesis 9:12-13 12God said, “This is the sign of the covenant that I make between me and you and every living creature that is with you, for all future generations: 13I have set my bow in the clouds, and it shall be a sign of the covenant between me and the earth. 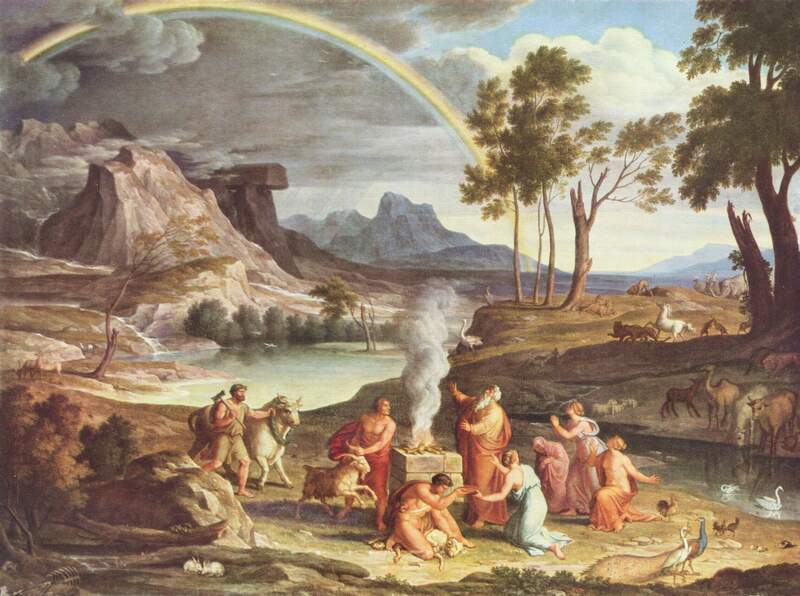 The Hebrew Scripture for Sunday was from Genesis 9, the covenant between God and the earth. Following the Flood, God voluntarily disarms, self-limits, herself by making a promise between Noah’s descendents and all creation never to destroy the earth again. It is promise made to all of creation not just humans. God’s promise means we are to be in relation with each other and all of creation. (If you are not familiar with God’s promise please read Genesis 9:8-17.) Above is the painting by Joseph Anton Koch of Noah’s Thanksgiving Offering, which we will be using for today’s Visio Divina. Respond to the image with prayer. Did the image remind you of an experience, person or issue for which you’d like to offer thanksgiving or intercession? In what way does God’s promise change, or not change how you visualize your relationship with the earth, each other, and God? Offer your thoughts as prayer to God. Rainbows are symbols of hope, and renewal following a crisis. May this day bring you your own personal rainbow.